After what was a very exciting day on Friday, as I did a fun foodie taping for JOJ.sk TV, Dan and I headed over to Astoria Bier & Cheese for a little respite and celebration. Wanting to stick to my gluten free diet (2 days to go! ), I knew they'd have some yummy options to choose from, some of them in beer form. 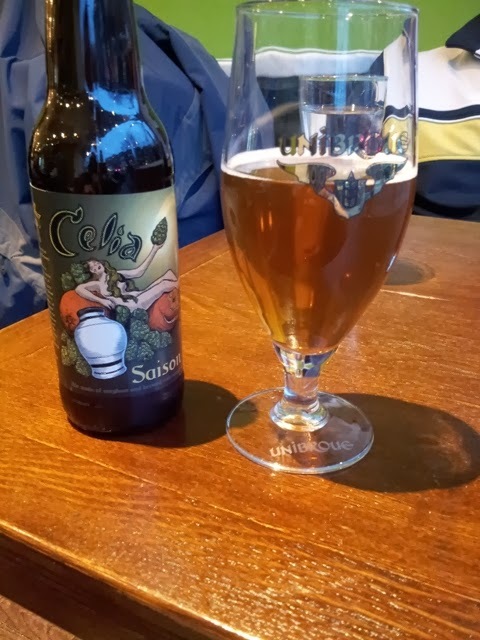 Celia Saison Beer - I must admit, the beautiful bottle design caught my eye, and the foreshadowing of fruity hints totally sold me. The beer comes from The Alchemist brewery in Vermont that's also the originator of the delicious Heady Topper beer. The Celia provided a smooth, slightly sweet and citrusy taste from the orange peel, which is one of its main ingredients. It's almost impossible to taste the difference between this and a regular beer, except that you don't feel uncomfortably full after. I give it two heady thumbs up! Jerky & Cheese Platter - Never mind the little bread slices on the side (I left those for Dan), but all the other stuff you see here is deliciously gluten free. All the jerky comes from a local supplier, Lawless Jerky and boasts three varieties including a chipotle honey, a Hawaiian style called Aloha Teriyaki and a Sweet Sriracha. And although the pieces are teeny, the flavor is intense and goes a long way. I loved pairing the meat with a sliver of cheese, the smoked gouda was particularly nice to pair with the spicy chipotle honey. Dan loved it too, but wished there was a more of it. We experienced good service and I liked how knowledgeable the staff was about the gluten free beer in particular. Once we sat down, our jerky & cheese platter came out promptly and our server thoroughly reviewed everything on our plate with us. 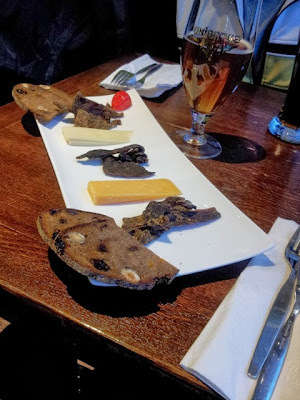 Costs are pretty darn expensive, not for the beer, but more so for the jerky platter, which set us back a whopping $13. With the beer, we paid about $28 in total including tax and tip.